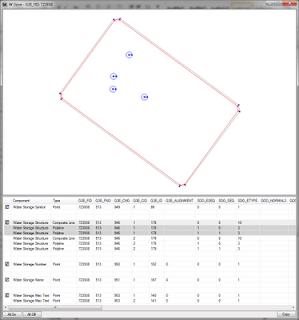 With version 1.0.0.34 of the GT/Metadata Explorer, a new feature has been added to the Find Feature tab to show detailed information about feature's geometry. The Find Feature tab already provided commands for Attribute Info, Style Rule Info, Connectivity Search, and Ownership Search for any feature found using an Attribute Query, Find by FID Query, or a Predefined Query. The Geometry Info command finishes off this set of commands for getting detailed information about a feature. 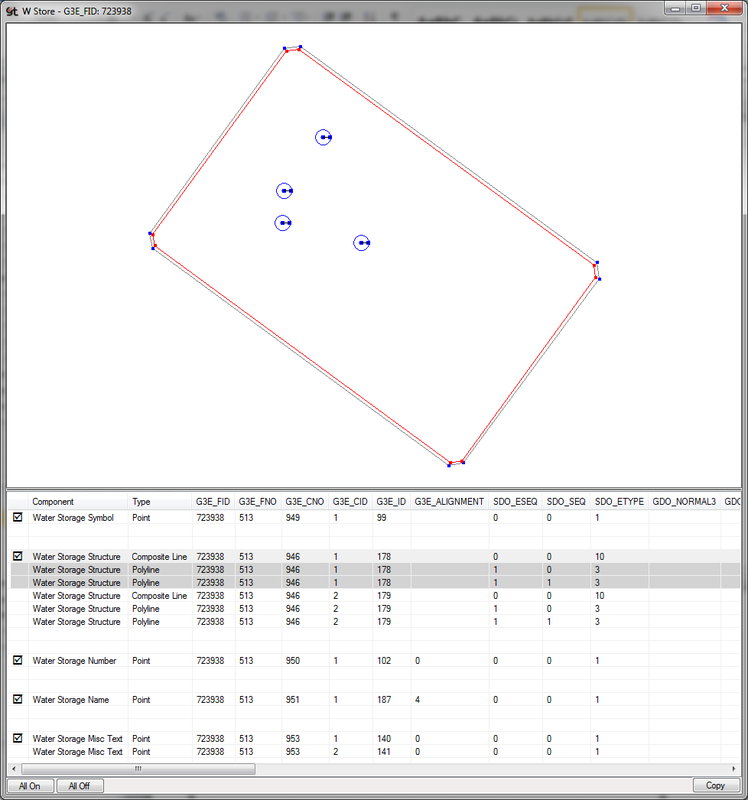 By selecting a feature in the query results and pressing the Geometry Info button, all of Tabular geometry information for each component associated with the selected feature as well as a graphic preview will be shown. The Geometry Info dialog provides a split view with the Preview on the top and the Tabular Information on the bottom. Selecting a row in the tabular data will highlight the associated graphics in the preview area in red. If the tabular row contains a Composite Line, Composite Polygon, or Collection, all of the child records will be highlighted in both the tabular view and the preview. For features with multiple graphic components, all geometries will be shown in the preview. A checkbox appears on the first line of each component in the tabular view. By default, all of the checkboxes will be checked, and all components are shown in the preview. You can click on the checkboxes to hide or show any of the components. The All On and All Off buttons at the bottom left corner of the dialog will check or uncheck all of the components with one click. Point geometries (Symbols and Labels) are represented as hollow circles with a smaller point at both the origin and another point showing the orientation of the point. Version 1.0.0.34 of the GT/Metadata Explorer is available. - FIX - #6351 - Provider version not shown correctly. - NEW - #6353 - Description or User name is show in the status box in the Successful or Unsuccessful connection status. - NEW - #6354 - If only one record is returned with a Find Feature Query, the row is automatically selected. 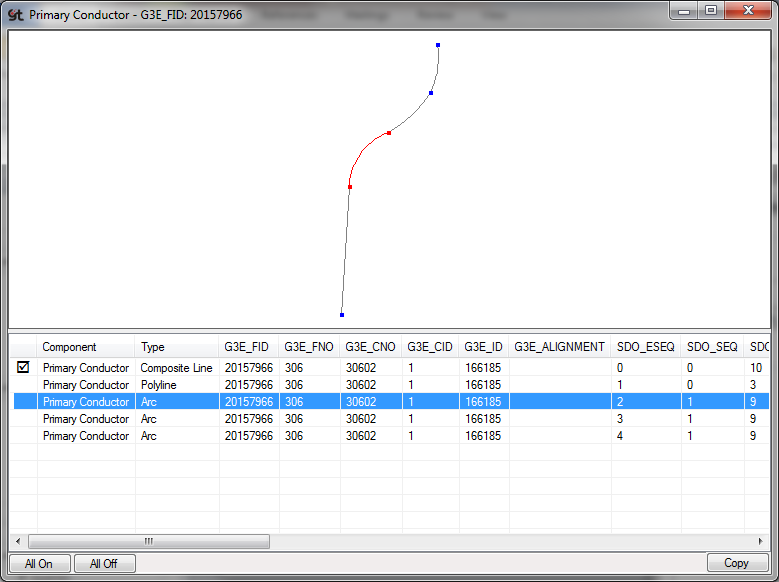 - FIX - #6355 - Composite Lines and Polygons will now show gaps with a dashed gray line. - FIX - #6356 - Connection Tab will now resize to fit the form after resizing. 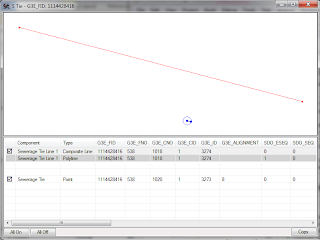 - NEW - #6339 - Geometry Info has been added to the Find Feature tab. - FIX - #6340 - When the Find By FID tab is selected, the search box now gets focus. - FIX - #6349 - Initial connection was slow when GetAttributeEntry method tried to get an empty Ano value. - NEW - #6350 - Find By FID now remembers the last 25 searches. Coordinate Factors – What are They? How Do You Set Them? The topic of Coordinate Factors is often raised and until this post there has not been a single good description of what they are and how you should set them. Most users just accept these 6 magic numbers that were provided to them the first time their data was converted and don’t give them another thought. 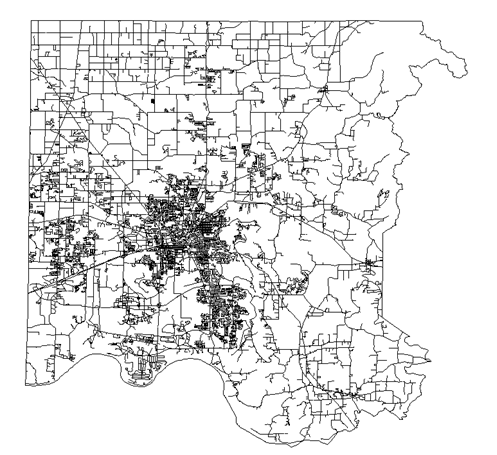 However, if your data changes its coordinate projection, you acquire data from another area, or you simply deal with many different datasets on a regular basis, it may be helpful to have a better understanding of how Coordinate Factors work. The Coordinate Factor values are used to convert Real-World Coordinates (sometimes referred to as Computed Coordinates) to GTViewer’s Internal Coordinates (sometimes referred to as System Coordinates) and vice versa. Real-World Coordinates are coordinates in the data’s native coordinate system, such as State Plane, Latitude/Longitude, UTM, etc. These values are usually double precision floating point numbers. 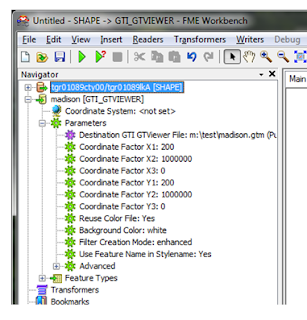 GTViewer’s internal coordinates are stored such that they require less storage space in the graphic files (.gtg) and the spatial index files (.gtn). Instead of storing coordinate values as double precision floating point values (which are 8 bytes each), they are instead stored as an unsigned 32 bit integers (which are 4 bytes each). This change of type brings an immediate 50% saving in the data size; however, the internal coordinate values no longer reflect their real-world positions. To get around this problem, the Coordinate Factors provide the necessary information to restore the internal coordinates to real-world coordinates. There are really only two places where the effects of the Coordinate Factor values can be seen in GTViewer: the Coordinate Readout on the status bar and the GPS Functionality. Without the Coordinate Factors, the coordinate readout on the status bar would show GTViewer’s internal coordinate values which are likely meaningless to the users. With properly configured Coordinate Factors, the readout will show Real-World coordinates. The GPS functionality must be able to convert the Latitude/Longitude coordinate it gets from the GPS Receiver to GTViewer’s internals coordinates so that the GPS Indicator can be drawn at the right position. GTViewer’s coordinate transformation routines will convert points from Latitude/Longitude to one of the many Real-World coordinate projection systems it supports, then the Coordinate Factors are used to take the real-world coordinates to GTViewer’s internal coordinates system. It may not be obvious how the Coordinate Factors should be set just by looking at the formulas above, but the goal is simple. The coordinate factors are set so that any point in the dataset (Real-World coordinates) will map to a point whose X and Y are both unsigned (positive) 32 bit integer whose range is 0 to 4,294,967,296. There are many ways to figure out what the Coordinate Factors should be to meet this goal, and I will go through the simplest approaches below. Think of GTViewer’s coordinate space as a window whose lower left is always (0,0) and whose upper right is always (4294967269,429967296). This coordinate space is very large even if it is somewhat smaller that a double precision floating point coordinate space. To map the real-world coordinate values into this window, we simply adjust the coordinate factors so that the real-world points are properly scaled and shifted. The Coordinate Factor X2 and Y2 are the multipliers (which will scale the data), so they are used to get the precision you need for the GTViewer data. 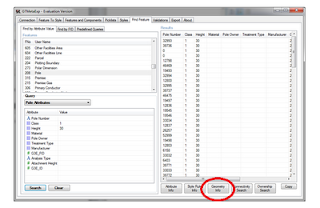 With Latitude/Longitude data, you need around 6 decimal places, so you can set the X2 and Y2 to 1,000,000. Then when the Real-World X or Y is multiplied by the X2 or Y2 Coordinate Factors, you will get 6 of the digits after the decimal place as part of the number. If your data is in Feet or Meters, then can you set the X2 and Y2 to 100 or 1000, which means that you will get precision to 100th or 1000th of a foot or meter. To preserve 6 decimal places, we set the X2 and Y2 Coordinate Factors to 1,000,000. The Multipliers preserve the precision when the values are converted; however, in the example above, the GTViewerX value is negative. The X1/Y1 and the X3/Y3 Coordinate Factors are the Shift values and come in here to move the data back into the positive space. 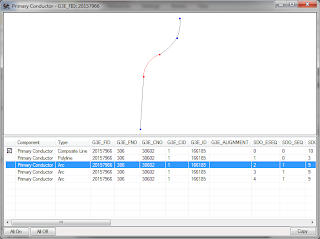 It is also possible that the GTViewer coordinate values may exceed the 4,294,967,296 maximum after the Multipliers are applied, so the Shift values can also be used to move the data back down into the desired coordinate space. The difference between the X1/Y1 and the X3/Y3 Coordinate Factors is that one is applied before the Multipliers and the other is applied after the Multipliers. This difference also means that the X1/Y1 Coordinates factors will be in Real-World units, while the X3/Y3 Coordinate Factors are in GTViewer’s System units. It generally doesn’t matter if you use the X1/Y1 or the X3/Y3, and you would rarely use both at the same time. The Converted Coordinates meet the criteria of being between 0 and 4294967296 and we preserve 6 decimal places of precision from the original values. It is a good idea to test the extreme values (lat: -90, long:-180) to ( lat:90 to lon: 190) through the formulas to make sure they still fit in the GTViewer coordinate space, but for brevity I will omit that from this posting. 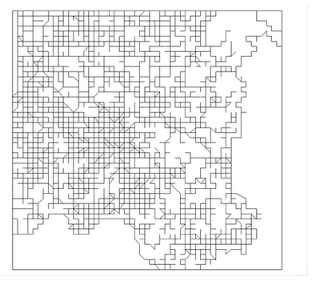 Since most user data is probably in a State Plane coordinate space or similar, I will go through the process for determining the Coordinate Factors in this case as well. The Real-World Coordinates are generally in Feet or Meters and we typically do not need more than 2 or 3 decimal places for precision, so the X2 and Y2 Coordinate factors can be set to 100 or 1000. If your data range is positive, you may not need an X1/Y2 or X3/Y3 to shift the data. We can mathematically compute the perfect Multipliers and Shift values to maximize the amount of the GTViewer coordinate space, but this extra work usually causes problems in the long run. Just make sure the values are positive and there is a little buffer around the data. 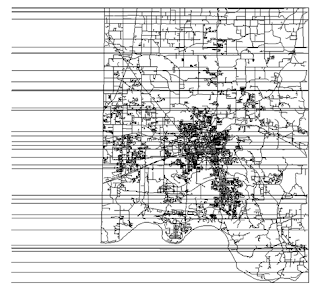 It is a good idea to know the approximate range of your dataset in Real-World coordinates. If you have any negative values, then you will have to shift the data into the positive space by setting X1/Y1 to at least the absolute values of the smallest negative value (plus a little more for a buffer). If your highest values after the Multiplies are applied are greater than the 4,294,967,296, then you can set your X1/Y1 or X3/Y3 values to a negative value to brings the values under the limit. 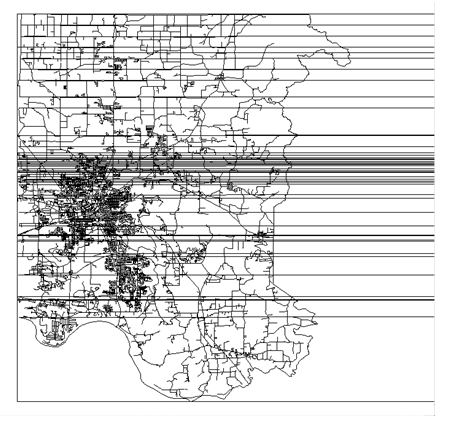 This description is vaguer than my description for Latitude/Longitude data, but there are simple tests to see if your Coordinate Factors are good. 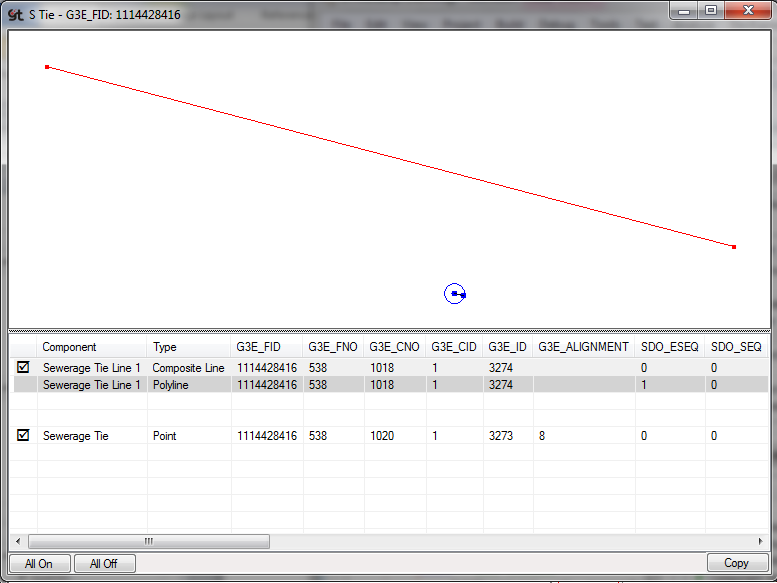 If you look at the data in GTViewer and the data “wraps” around to the other side, then the data needs to be shifted. The following example shows data where the coordinates have negative values and the data is wrapping around from the left to the other side of the design plane. The data needs to be shifted to the right, so the X1/Y1 need to be set to higher values. The following example shows where the data has exceeded the 4,294,967,296 maximum and is wrapping around from the right to the other side of the design plane. The data needs to be shifted to the left, so the X1/Y1 need to be set to lower or negative values. 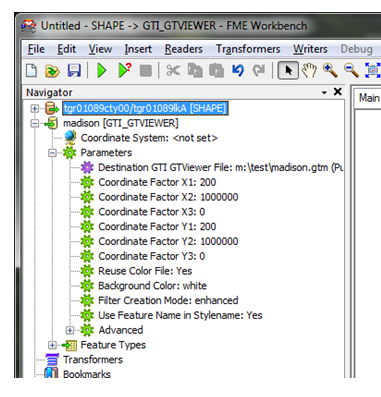 Wen using the FME Writer for GTViewer data, you are required to set the coordinate factors in the Destination Parameters. These Coordinate Factors work exactly as described above; however, they are used as part of the conversion process. 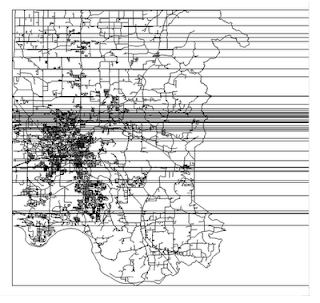 Setting the coordinate factors is a one-time thing, so expending a lot of computation effort to set them each time the data is converted is not practical. All of the data would have to be processed to get the range, then processed again for the conversion. Data is notoriously bad. 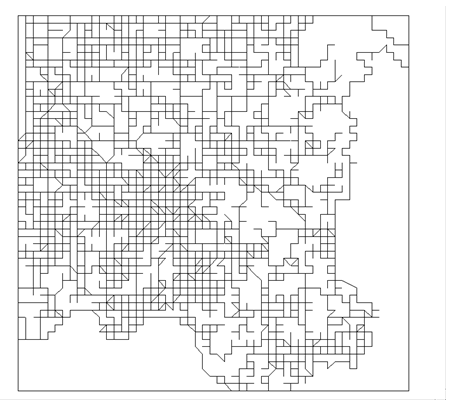 One stray feature would corrupt the range and create a bad set of Coordinate Factors. You don’t want the Coordinate Factors to change from one run to the next. 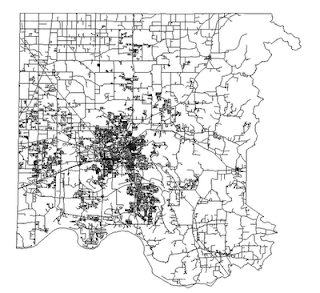 Adding new data to a dataset could change the range which would change the Coordinate Factors. 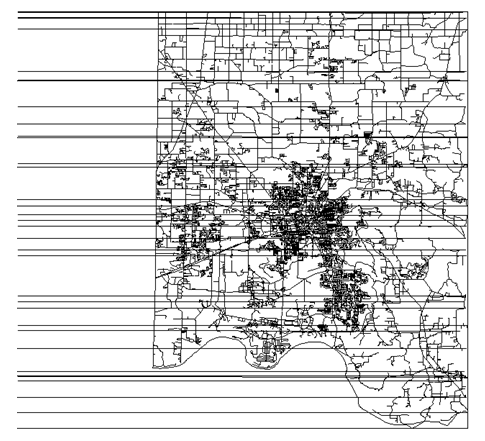 Then data from previous runs and redlines would not overlay with the current data. Working with Microstation/IGDS data has a few interesting quirks that can be taken advantage of if you know what to do. A DGN file is also bound by a 32 bit integer Design Plane. However, the Global Origin concept is used to specify where in the Design plane (0,0) occurs allowing negative values to be used. By default, the global origin is in the middle (2147483648,2147483648) which allows the design plane to have a range of something like (-2147483648,-2147483648) to (2147483648,2147483648). The X3/Y3 Coordinate Factors can be set to 2147483648 to compensate for the origin. If the Global Origin is set to a specific location, then Coordinate Factors must reflect this configuration. GTData contains a utility called GTGetOffset that will attempt to get global origin info as well as the UORs per master unit from a DGN File and generate the CoordinateFactor entries for the .GTM file. While this utility is not always correct (depending on the configuration of the data), it can be very useful. The PGTViewer .NET Control for Window Mobile version 9.0.0.3 is available. - FIX - #6331 - Opening and closing files with certain modes active would cause problems when the modes were deactivated withouth the file available. - FIX - #6332 - Measure Computation was incorrectly handling the MeasureFactor and was not handling the MeasureDegreeFactor. ata were not handled correctly, especially if the the group itself did not have a linkage or embedded data. - FIX - #6313 - Stroking arcs with angles greater than 2*Pi would cause problems. - FIX - #6324 - ViewUpdate Event was sending the wrong value for xHigh. - CHG - #6325 - The Maximum number of Filter Ids per category has been increased from 2000 to 2500 to match the desktop version of the control. - NEW - #6277 - GetDataMonitorItemInRange method has been added. - FIX - #6282 - Capture Area and Capture Line modes will now accept a right mouse button to finish the action if the required number of points have been provided. The GTViewer .NET Control for Windows version 9.0.0.8 is Available. - FIX - #6329 - Opening and closing files with certain modes active would cause problems when the modes were deactivated without the file available. - FIX - #6330 - Measure Computation was incorrectly handling the default MeasureFactor and was not handling the MeasureDegreeFactor. - FIX - #6309 - The coordinate factors did not default to the system coordinate standard values if they were not defined in the .gtm file. - FIX - #6312 - Group element with sub-elements containing linkages or embedded data were not handled correctly, especially if the the group itself did not have a linkage or embedded data. - FIX - #6323 - ViewUpdate Event was sending the wrong value for XHigh. - NEW - #6262 - TrueType font support added to UDLS rendering. - CHG - #6273 - GetFeaturesInRange was not considering element whose category did not have a data id defined. - NEW - #6275 - VewUpdated event added. - FIX - #6279 - Finish button was not enabling for CaptureMode. - NEW - #6280 - Capture_Rectangle mode added to the ActivateCaptureMode method and a corresponding RectangleCaptured event has been added. - NEW - #6282 - Capture Area and Capture Line modes will now accept a right mouse button to finish the action if the required number of points have been provided. - FIX - #6256 - Blocking added to all DM_ and DM2_ methods, Feature Tooltip processing, Data Monitor Tooltip processing, and view rendering. FIX - #6258 - Fixes to the P/Invoke signatures used by the Control. - FIX - #6252 - Changes to the Feature Tooltip and Data Monitor Event firing mechanism to skip if any other mouse action is occurring. - FIX - #6253 - Raster Categories were not getting skipped during the rendering process. - FIX - #6255 - DeleteIndicator was returning 0 for invalid view, should return -1. - FIX - #6181 - The MeasurePrecision data property was not spelled correctly. MeasurePrecision and MeasurePrecison are both accepted now. - NEW - #6187 - Get Elements in Range functionality has been optimized. - FIX - #6189 - MeasureFactor defaults back to -1. 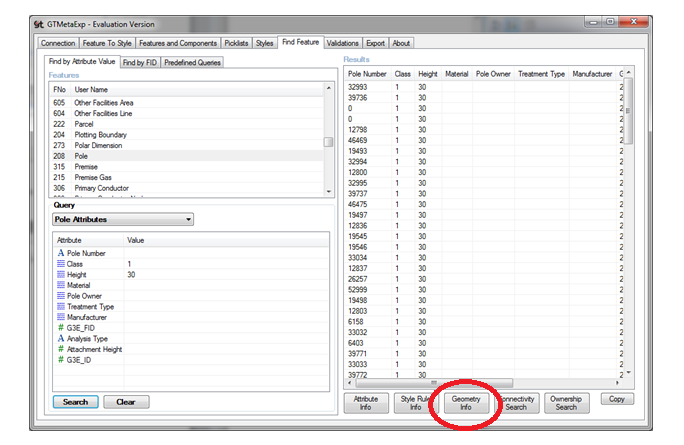 - FIX - #6190 - MeasureFactor can be set to -1 with SetDataProperty. - FIX - #6199 - Adjustments to the FeatureTooltip functionality. - FIX - #6200 - Attached views did not inherit the parent's Feature Tooltip properties (FeatureTooltipmaximumThreshold, FeatureTooltipMinimumThreshold, FeatureTooltipOmitBlankValues). - FIX - #6201 - If a Feature Tooltip label is blank and the value is blank, then the attribute is skipped. - NEW - #6204 - GetFeatureTooltipInfo method has been added. - FIX - #6205 - GPS_IndicatorMode was not being read from the .gtm file. - FIX - #6135 - Prioritized Arcs, Ellipses, and Circles were not correctly rendering. - NEW - #6139 - StyleDisplayThreshold, WeightDisplayThreshold, PriorityDisplayThreshold, StylePrintThreshold, WeightPrintThreshold, PriorityPrintThreshsold have been added to the Category section so that individual style, weight, and priority threshold control can be specified by Category. These entries will override the corresponding entries in the General Info section (which will be the category defaults otherwise). - FIX - #6143 - Force Black and White was not converting colors for elements using a style rule with a BorderColorValue specified. - FIX - #6162 - Background color defined in the .GTM file was not getting used if CreateSession were used. - FIX - #6163 - Activation Draw Move mode would not erase the initially placed element after the first mode.